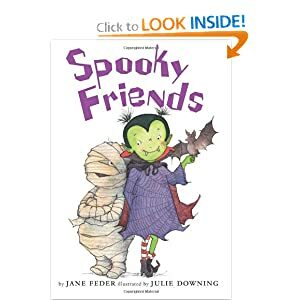 In Spooky Friends , Scarlet is a feisty little Vampire, and her best friend, Igor, is a roly-poly little Mummy. Together, they star in three humorous, heartwarming stories about two friends who never agree on anything. That is -- until they discover different ideas can become even better ideas when they cooperate! Jane Feder was an elementary school teacher, a children's book editor, and is now an artist's representative. She is also the author of several children's books, including BEANY, an ALA Notable Children's Book, an IRA Children's Choice, and a New York Public Library Book of the Year. She lives in New York City. Julie Downing is an internationally published author and illustrator. She has illustrated over thirty highly acclaimed books for children. Her work has been exhibited in galleries throughout the United States and England. She lives in San Francisco, California. This was a cute book with multiple stories in one. Each of these stories brings out the unique traits of both of these friends and teaches the reader about friendship and personalities. The book also explores how important it is to be able to appreciate each unique aspect of the other as it is through these differences that great things can happen in the end. I loved the stories themselves, but even better the illustrations as they were a perfect compliment to the book itself. I read this with my youngest daughter and at the end, she asked me to read it again - always a great sign!